We got a message of congratulations over the weekend from WordPress, the company that hosts this blog. It said “Your stats are booming! Let’s Live in France is getting lots of traffic.” You were probably part of that frenzy, so thank you. It started when Bill posted on both the blog and Facebook that we were clearing out the basement with lots of things going to charity or the dumpster if they weren’t otherwise claimed. The response was overwhelming, so now there’s much less to give/throw away, but there’s still more…. Barb and Andi came by to claim their part of our treasures (thanks, you two) and stayed to play a few games of darts. We got to talking about this move to France and I mentioned that we’ve always felt lucky and that this was just one more example of that. Barb said that she’s often told the same thing about herself but while luck might be a factor, most of us have worked very hard to get where we are. She’s right, you know. We make our own luck. People do work a long time to achieve their goals and we consider ourselves fortunate to be where we are and able to turn a dream into reality. A few hours after Barb and Andi left, Bill and I continued the darts. The photo is where I somehow landed one dart directly on top of another. Lucky shot or hard work? It was fun, whatever it was! Posted on November 9, 2015, in Before leaving the US and tagged Americans in Carcassonne, Life in France. Bookmark the permalink. 2 Comments. Bob’s dart actually hit the very middle of the flight and the tip split it open perfectly. As you can see it did not fall so we were able to record this amazing event. Yes, he did win the game after that. Wow! I’m REALLY impressed! What a shot, not just luck but pure skill! 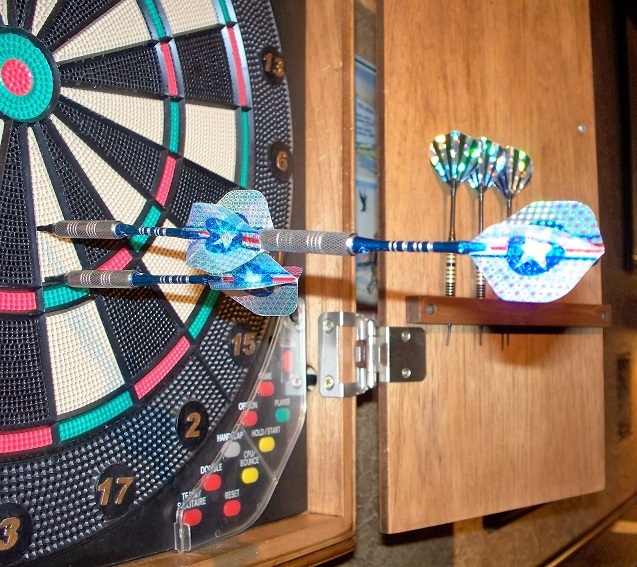 I can see that I’m going to have to put in many hours of practice before I play darts with you guys!